Using PuTTY and PuTTY Private Keys for server login are considered to be most secured way to log in to servers. They are but only to the extent of data transaction between your system and the cloud server. But within your organization, if a unauthorized person gets hold of the PuTTY Private Key (.ppk) file he can misuse the same making the entire system more vulnerable. Clouds like Amazon AWS, GitHUB, IBM allows PuTTY and ppk file to log in. TSafe2 file Protection for PuTTY is designed especially to prevent unauthorized use of PuTTY private key files (.ppk files). ow to use TSafe2 Putty file Protection Tool. Here is a brief guide on how to use TSafe2 Putty file Protection Tool. In just six steps, you can authorise persons to use Amazon cloud and protect the log in with USB Dongle. 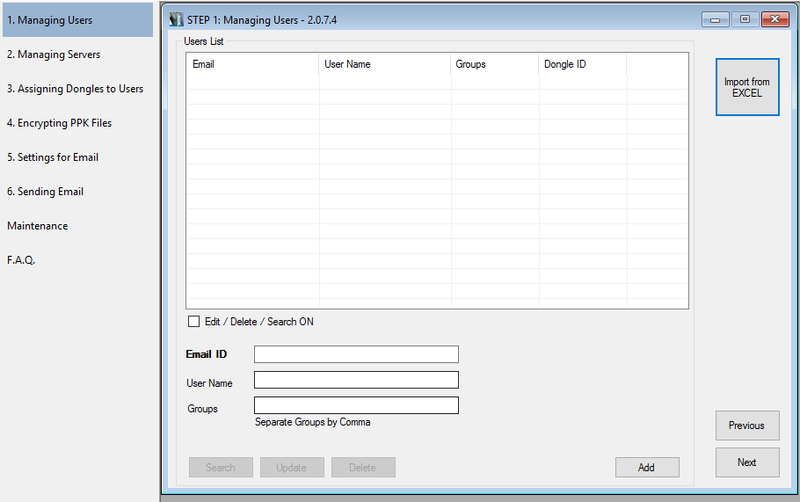 Users list can be created using importing data from an Excel file or entering one by one. Understanding Groups: Users and Servers both can be part of multiple groups. A group can be based on work, department or anything can that be used to co-relate user and server. Enter group names separated by a comma. Groups will be used to assign servers to users. Separate groups by a comma in the same column like G1,G2,G3 or Group 1, Group 2, Group 3. Space is allowed. Do not keep header. Records should start from row 1. 2. Click on Import from Excel button. Select Excel file when prompted and click OK. 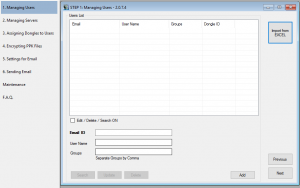 Enter Email ID, User Name and Groups. Check the checkbox Edit / Delete / Search ON. Type search string in the fields and click Search. The search will display result matching any part of the fields. To edit, select user from the list, make changes and click the Update button. 2. 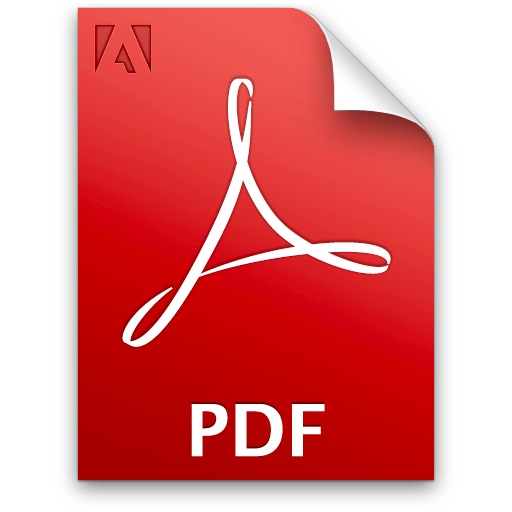 PPK files should be placed in the same folder as Excel file. The name of PPK should be Instance ID or server. 3. Enter groups separated by comma similar to users. 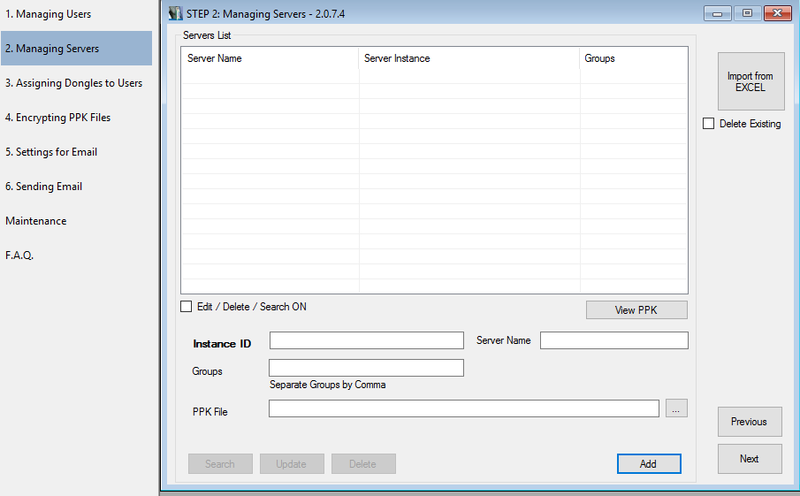 To add a server enter the details, Server Name, Instance ID, Groups. To edit, select a server from the list, make changes and click the Update button. To ensure that proper PPK file is saved in the database, select the server and click “View PPK”. You must do this before you proceed to next step. Preparation: Keep dongles and marker pen ready to write user’s names on dongles. Check the users in the user list for whom you want to create the dongle and click on create dongle. System will ask you to remove dongle, mark user name on them and insert new dongles. You can see the Dongle ID assigned to a user in the user list. If a dongle is already used system will ask you to conitnue using it or attach new dongle. If you do not assign dongles to users, you will not be able to encrypt PPK files for that user in the next step. You can search for a specific user or group to enable faster selection of users. Searching for a group will give all users of that group. If you find the user list empty, that means you have not assigned dongles to the users yet. You can search for a specific user or group to find specific user. Click row in user grid to select. It will display server list based on groups. You can select or deselect a server. Click “Submit”. PPK files for only selected servers will beÂ encrypted. Check “Select Multiple Users” checkbox to allow you to select multiple users up to 250 at a time. Select users as you need. And simply click “Submit”. Encrypted PPK files will be saved in “TSafe2 PuTTY Development” folder in My Documents folder. To ensure that users are assigned proper groups, select the user and check server grid. For changes you have to go to either Step 1 (Alt + 1) or Step 2 (Alt + 2). 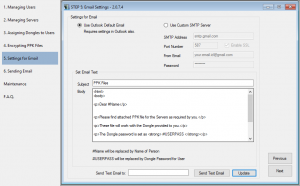 Sending Email requires SMTP server settings. You can use Outlook if your email account is already set in Outlook. Just select Use Outlook default Email. Alternatively, you can provide SMTP server details. 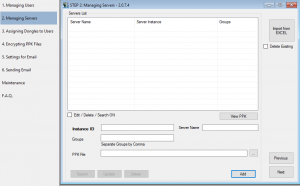 select Use Custom SMTP Server and provide custom SMTP server details. Just note that your SMTP server may also need some settings to allow software to send email. Setting email text is very important because dongle password is communicated to user by email only. There is no other way to extract password. It’s a safety restriction. Use USERPASS tag in the body text to specify the Subject in the given field. Similarly, Name can be used for username. For â€œBody Textâ€ use a valid HTML. 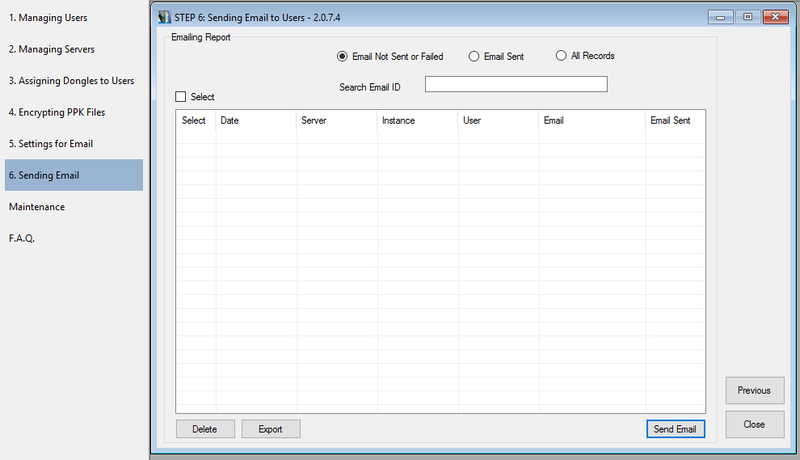 Provide send to email and click “Send Test Email” to testing your setting. Check your “Inbox” to see if you have got email correctly. In the test email, Name and USRERPASS tag will not be replaced by any username and password. Displayed data can be filtered using three options, email not sent or failed, email sent and all. The default is email not sent or fail, so when you open the form you directly get the list for which email is pending. This will include the work just done and also pending. Best and fasted way is to select all record in “email not sent or fail” list and click “Send Email”. You can select any specific record and send email also. Select the records and click “Delete”. Select the proper filter and click “Export”. It will ignore row selections and export all records in the list to an Excel file, the system will ask you to provide a file name.